There are very few experiences as incredible as riding a bike; the wind in your face, the sensation of generating speed under your own power, the balance of forces that almost magically hold the bike suspended upright. It is the closest we humans will ever come to feeling the miracle of flight; it is the closest we can come to knowing what it must be like to be a bird. Cycling is my passion, my greatest hobby, my obsession. From a young age, I have been taking it seriously, slowly growing my dependence and interest in life behind bars. It was during the summer when I was eight or so years old that I first set a legitimate training goal, and took to the bicycle as my primary means of summer training. It isn’t a unique story, how the bicycle intervened into a skier’s life and somehow took over, but the point is that I hardly recall a time in my life that the bicycle didn’t hold some enormous meaning for me. Before I became a Cyclist as a pre-teen, I learned to ride a bike on the dirt trails behind my parent’s house. With this acquired skill, my range of travel increased dramatically. I could suddenly meet my friends who lived far enough away that I couldn’t walk there. I could ride to and from school, I could ride to the lake and swim with my friends. The bicycle was simple, carefree. It was freedom. This is the great paradox of La Vie Velominatus: the more serious and passionate we become, the farther we are from that juvenile pleasure and freedom afforded by the bike. As Velominati, each ride serves a purpose, whether that purpose is to follow a training plan, feed the Good Wolf, or to spend some quality time with ourselves as introverts. Last weekend, my girlfriend and I whimsically decided to jump on our bikes for a midnight ride around the neighborhood. No helmets, no lights, no plan; just two people riding around, choosing the route on a whim, talking about life, love, and laughing. It was perhaps the first time in more than thirty years that I felt the raw childhood whimsy of riding a bike for its own sake. It was one of my favorite rides, ever. Cycling is indeed my passion, my hobby, my obsession; I am eternally grateful for the gift it has given me throughout my life. But somehow, I’ve lost the original connection I had to the bike from before I became a Cyclist. I am resolved to rebuild that and continue to indulge in the joyride. I’m not sure I could cope with giving up a whole afternoon for 1hours racing, and also the mud. Not much different from crits… can always jump in a couple of races. And yea, the mud… the issue with CX and MTB is always having to fix something it would seem. And clean, clean, clean… Though here in AL, USA we can get long stretches of really dry gorgeous fall/early winter weather for CX. I raced much of season last year on file treads and expect to do that this weekend to start the season. So much fun and usually a super cool vibe and great intro for kids too. Timely article! With a four month old, not much time or interest in going on long road rides. Any free time I’ve got to squeeze in chores, bike work, a hello to the VMH, or something I’m not able to do while tending to the little guy. Or spend time with him that I can’t during the week, due to work. That means almost all my riding is joy riding, grocery getting, or commuting to work. As much as it angers me that riding on a flat MUP can cause me to lose breath, you can always get the form back, but not the first few months with a new child. And, I’m not worrying about form, racing, etc. Just riding for the goddamn fun of it. The one prayer I have is that the VMH will want to ride more in the near future. She likes being on a bike, but we’ve never done it frequently. I’m seriously jealous when I see roadie couples and both look the business! I’m currently building up a new cross frameset for a do-it-all bike. Damn, I love building bikes that don’t have to be perfect or top-line components. As much as I love my beautiful road machines, I really am acquiring a love for workhorse bikes that can do it all, that you don’t mind dinging or locking up, and that you can use for a fast road ride or a stroll to the water hole. It’s gonna be pretty slick and all my own creation! My new joyride! 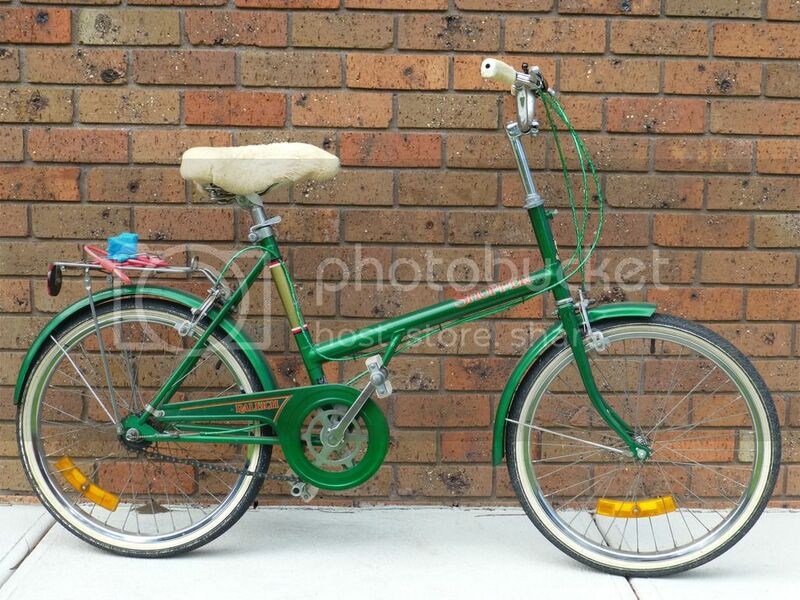 Saved this Raleigh Shopper (22″) from kerbside collection. Brings a huge smile every time I ride!